Today has been a very busy day here at the 12185 Coronado Drive Pantry. We had two drop offs, both with amazing items. One of my favorite things about all this is to organize the donations that come in. If there are a lot of the same items I will put some out and put some away in a closet I have designated for the pantry supplies. Each day I walk out to the pantry with my boyfriend Bruce and clean up and restock if need be. Our first donation today was by Vanessa, another pantry owner. She made a trip to the store and bought some extra stuff for us. So very sweet of her! Thanks Vanessa!! We put out some toothbrushes, soap, and feminine pads into the personal hygiene bin. This is the super fun part, stocking and filling the pantry with food for others to use when they need it. A lovely mother and daughter came by before dinner time with a large box full of stuff. They were the second donation of the day. It was so nice to meet you, whoever you were. If you ever read this, know that I am truly thankful for your kindness!!! They left us a lot of stuff. You can find canned vegetables, Asian and Oriental noodles, soup, jello, baking items, pasta, seasoning packets, salad dressing and a few other things. This is all so amazing and it’s a joy to be a part of. Something to really think about, people who may not have had food, now do. This is a way for others to have support and extra food available to them at all times. As I sign off here to go check the pantry… Someone may have dropped something off or took some things. I gotta go check. But first, this is what the pantry looked like just before dinner time after the second donation. It’s packed!!! 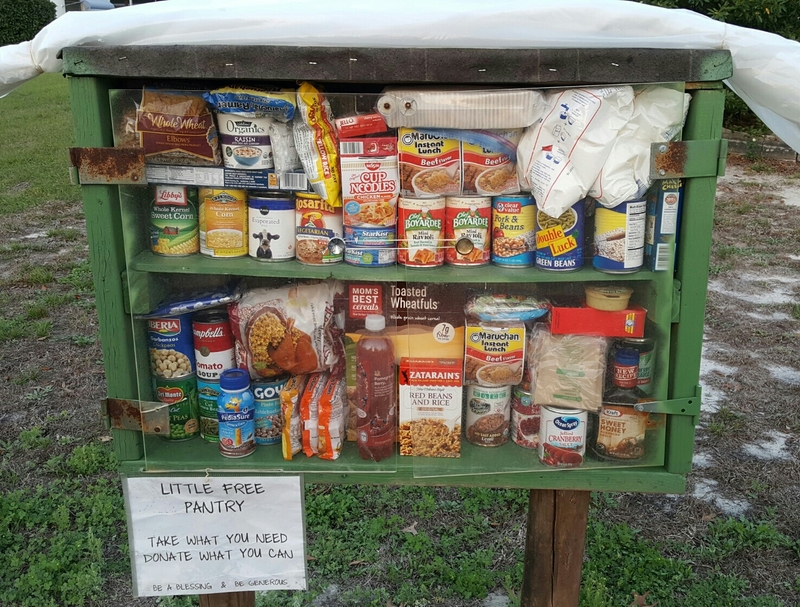 If you live in the area of Spring Hill, FL, please come visit and see what this pantry stuff is all about!